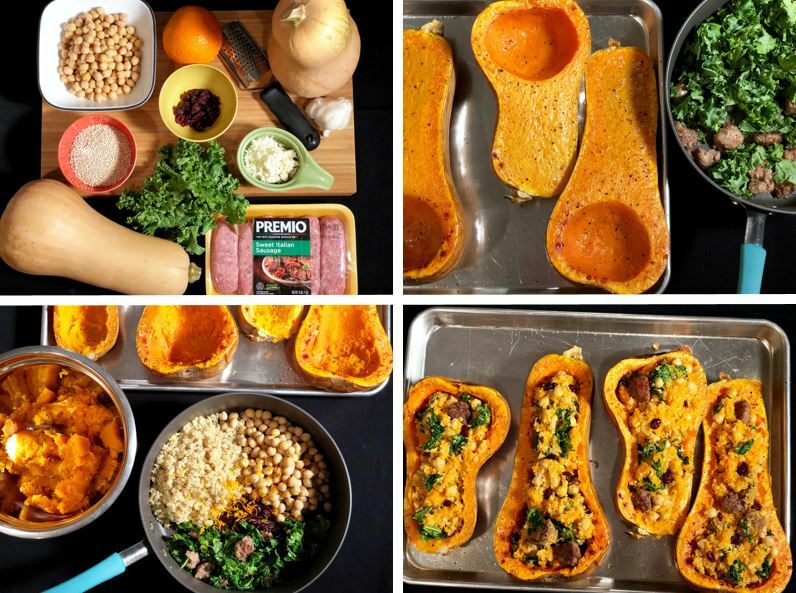 Looking for a healthy, hearty vegetable dish filled with all the flavor and satisfaction of a down-home meal? 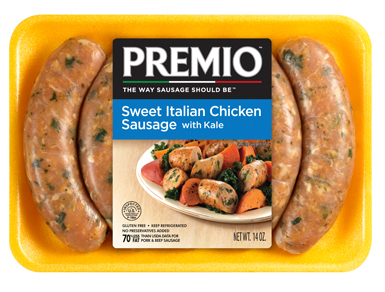 Packed with the complex, complementary textures and flavors of sausage, kale, cranberries and chickpeas and finished with a zing of orange zest, this nutritious, nourishing meal is ideal for any occasion. 1. Preheat your oven to 425°F with a rack in the center. 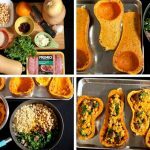 Cut each butternut squash in half, scoop out seeds and place on a baking tray, cut-side up. Drizzle 1 tsp. olive oil over halves and lightly sprinkle with salt and pepper. 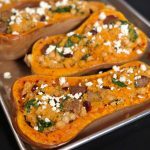 Bake in the oven for 45 to 55 minutes until the squash is gently tender. Remove from the oven to cool and reduce the heat to 375. 2. Meanwhile, heat your broth in a small saucepan, bringing to a boil, adding quinoa and boiling again. Cover and reduce heat to low, simmering for 10 to 12 minutes or until broth is mostly absorbed. Remove from heat and set aside, still covered, fluffing with a fork after 15 minutes. 3. In a skillet over medium heat, add 1 tsp. 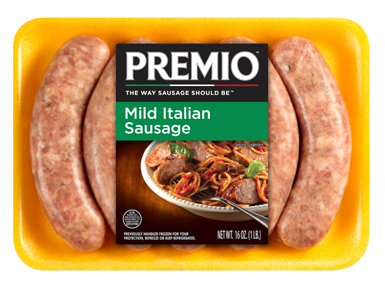 of olive oil and your sausage links and saute until firm and browned, then break into small pieces and stir to cook thoroughly. 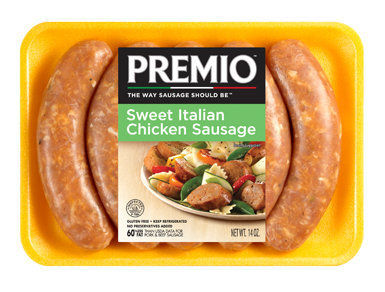 When sausage meat is cooked through, add the last tsp. olive oil with the chopped kale and cook for about four minutes or until kale begins to wilt. Reduce heat to medium-low and add salt pepper, garlic and oregano, then stir in quinoa, chickpeas, cranberries, orange juice and orange zest. Mix well and leave on low heat. 4. When your squash has cooled enough, scoop out the soft squash flesh, leaving a 3/4-in. 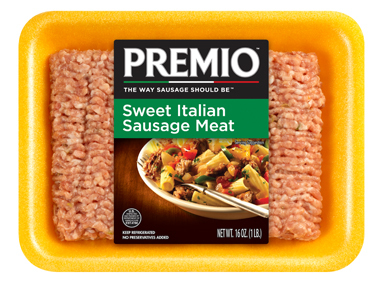 thick border on the insides, and mix the flesh with the sausage quinoa filling until well-incorporated. 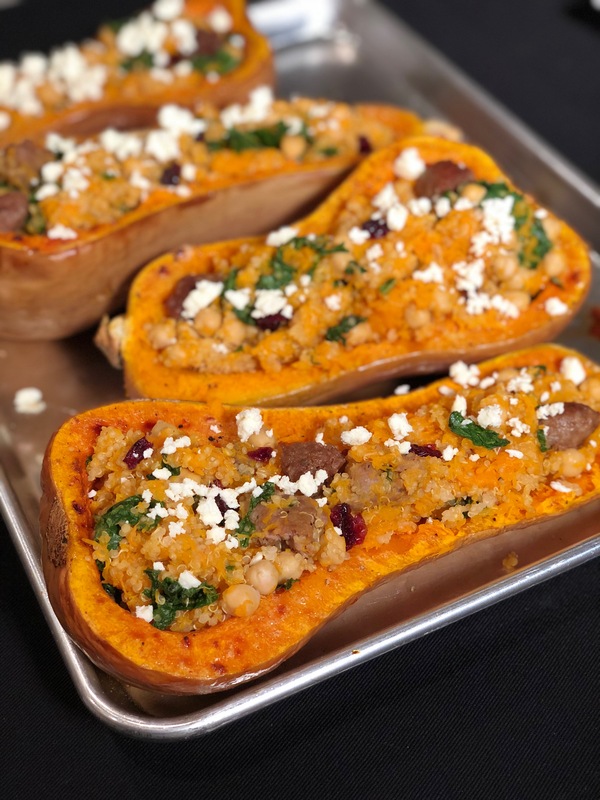 Stuff your quinoa filling into the squash halves, dividing evenly, and place them back into the oven to bake at 375 for an additional 10 minutes. Remove from oven and sprinkle with cheese. Serves four. 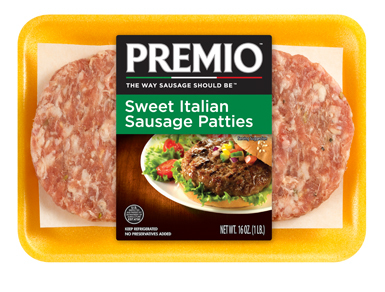 Salivating over Premio Sweet Italian Sausage? 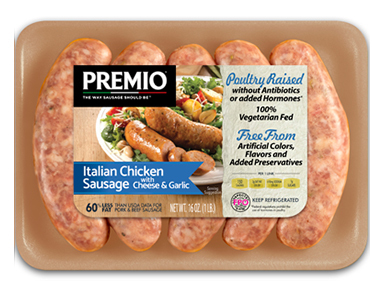 Add all our delicious sausage varieties to your dinner and side dish recipes. Find our products today in a store near you.